One Breath is a gripping and powerful exploration of the strange and fascinating sport of freediving, and of the tragic, untimely death of America's greatest freediver. Competitive freediving - a sport built on diving as deep as possible on a single breath - tests the limits of human ability in the most hostile environment on earth. The unique and eclectic breed of individuals who freedive at the highest level regularly dive hundreds of feet below the ocean's surface, reaching such depths that their organs compress, light disappears, and one mistake could kill them. Even among freedivers, few have ever gone as deep as Nicholas Mevoli. A handsome young American with an unmatched talent for the sport, Nick was among freediving's brightest stars. He was also an extraordinary individual, one who rebelled against the vapid and commoditized society around him by relentlessly questing for something more meaningful and authentic, whatever the risks. So when Nick Mevoli arrived at Vertical Blue in 2013, the world's premier freediving competition, he was widely expected to challenge records and continue his meteoric rise to stardom. Instead, before the end of that fateful competition Nick Mevoli had died, a victim of the sport that had made him a star, and the very future of free diving was called into question. 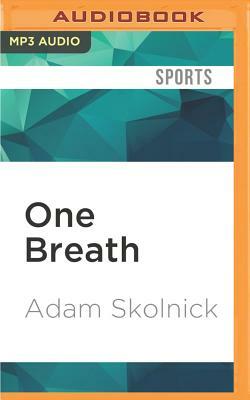 With unparalleled access and masterfully crafted prose, One Breath tells his unforgettable story, and of the sport which shaped and ultimately destroyed him.